Drchrono, a startup that simplifies the professional lives of doctors by bringing electronic health records and much more to the iPad, has raised another $650,000 in seed funding from DST founder Yuri Milner and General Catalyst. In July, the company raised $675,000 in seed funding from General Catalyst, Charles River Ventures, 500 Startups, Gmail creator and FriendFeed cofounder Paul Buchheit, Google’s Principal Engineer Matt Cutts, and the Start Fund. As we’ve written in the past, drchrono’s iPad app allows doctors to schedule patient appointments, dictate notes via audio, take pictures, write prescriptions and send them to pharmacies, enable reminders, take clinical notes, access lab results, and, most importantly input electronic health records. Now, drchrono is looking to disrupt another part of the medical office experience by providing a new iPad app, called OnPatient, which replaces the patient check-in process. So, as soon as you enter a medical office, you are generally given a clipboard with a number of forms to fill out in the waiting room, including general information, medical history, confidentiality agreements and more. Now doctors’ offices can give users Drchrono’s free iPad app instead of a clipboard. On-Patient allows patients to complete family medical history, demographic information, and insurance information; take a profile photo and sign the HIPAA consent form with a digital signature. With the app, you can only fill out your form and are locked into this interface so patients won’t be able to switch to other apps or access other patients’ information. And to make doctors’ lives easier, the app integrates with drchrono’s medical records interface, so medical personell don’t have to type in all the patient information. On subsequent visits, patients do not have to complete duplicate forms—they need only review their information and make any necessary changes on the iPad. This is just another way in which drchrono is making the lives of doctors and their employees easier. As you may have heard, the Obama administration is currently offering incentives for doctors to start moving their health records online. drchrono was approved to qualify doctors for receiving $44,000 in incentives when they use the software as an electronic medical records platform. 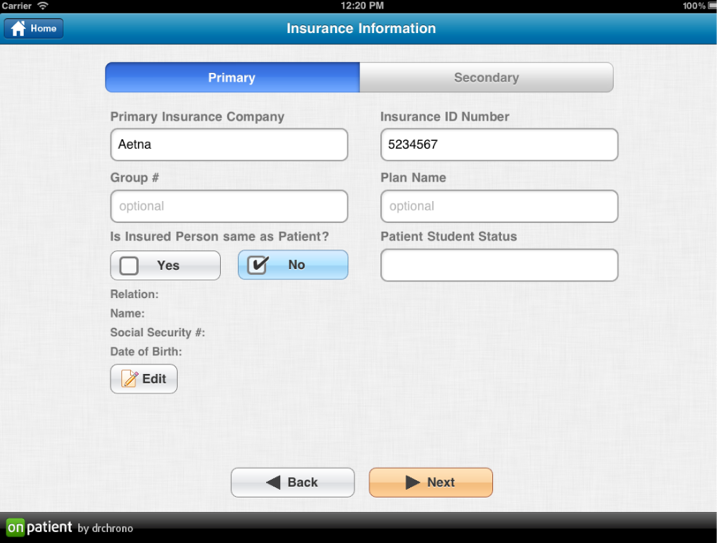 In fact, drchrono is the first native EHR on the iPad to be certified for Meaningful Use under the incentive. Michael Nusimow, co-founder and CEO of drchrono, tells us that the company has also sweetened the deal for many doctors and is now waiving the set-up fees for its EHR platform (drchrono operates a freemium model). And he reiterated the company’s goal: for every doctor in the country to be using drchrono for medical records and data input.